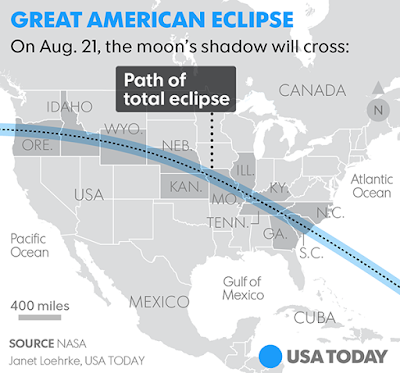 The Great American Eclipse of 2017 will come and go on Monday, August 21 for approximately a three-hour span, but the impact will affect millions throughout the day. An estimated 12 million people live within the path of totality and the number of people within just one day's drive of the totality zone is around 200 million. In northern Kentucky, you'll be able to experience a 93% totality of the eclipse, but viewing the eclipse without the proper eyewear can be potentially dangerous. Although it may seem like this historical event may have snuck up on society, eclipses of the sun can be predicted thousands of years in advance. Astronomers has had this eclipse on their calendars for decades now. Several northern Kentucky school districts have announced classrooms will be closed Aug. 21 for the rare solar eclipse, while others are incorporating the event into their curriculum. Fort Thomas Independent Schools, along with Beechwood Independent, are taking the latter approach. Highlands Middle and High School students will be dismissed at 3:50 p.m. , while elementary students will be dismissed at 4:00 p.m. Schools will alter class schedules or have planned events up until dismissal time. No after-school activities will begin until 4:00 p.m.
Parents may sign out students earlier in the school office if absolutely needed and each child who wishes to participate must have a signed permission slip turned in. Fort Thomas Independent Schools Superintendent, Karen Cheser, said those would be sent to parents via Schoology, Infinite Campus and with students. "This will be an extraordinary educational opportunity for our students as the last solar eclipse occurred in the USA in 1918," said Cheser. "While the event is extremely exciting for our students, we must also acknowledge the importance of proper eye safety." Cheser reported to the board on Monday that the district has purchased NASA-approved, ISO-certified viewing glasses to help the schools navigate this day safely. With foresight, that shipment will arrive this week. "The eclipse must only be viewed through ISO-certified glasses, " said Cheser. "Please help us reinforce this with your child. Our teachers will provide the glasses and brief supervised viewing of the eclipse." Dr. Josiah Young, owner of Opticare Vision Centers, is a Fort Thomas resident with children in the district. He said he applauded the decision of the district to not cancel and to keep the kids in class. "I think the school is doing a great thing to protect the students and make it a great learning experience at the same time. The school district is in a unique position to be able to help these kids safely enjoy one of the great astronomical events of our lifetime. Because of the timing of the eclipse, the kids would be let out right as it is occurring," he said. Young said that because there's some amount of "shade" over the sun during the eclipse, people get a false sense of security. "Trying to look at the eclipse without protection can result in permanent damage to your eyes. There will be no time in which the eclipse is safe to view without protective eyewear.Those in the path of 100% or "totality" can take off their glasses for about 2 minutes and view it as it is totally eclipsed. But the rest of the time, everybody will need the eclipse viewing glasses no matter where you are. You can imagine a bunch of elementary and middle school kids being let out of school , pointing to the sky, but if they try to look at it for a few seconds, they could do some real damage to their eyes." According to NASA, experiencing a total solar eclipse where you live happens about once in 375 years. The last time anyone in the United States witnessed a total solar eclipse was almost 40 years ago, on February 26, 1979. It's been even longer -- 99 years -- since a total solar eclipse crossed the country from the Pacific to the Atlantic. The total eclipse on June 8, 1918, passed from Washington to Florida. More information about the solar eclipse can be found at www.nasa.gov/eclipse. If you have any questions, please contact your child’s school or our district office. PHOTO: School Board members, John Weyer, Karen Allen, Karen Cheser (Superintendent), Brad Fennell (Chair) and Lisa Duckworth.